Tom thanks for the information and nice words. 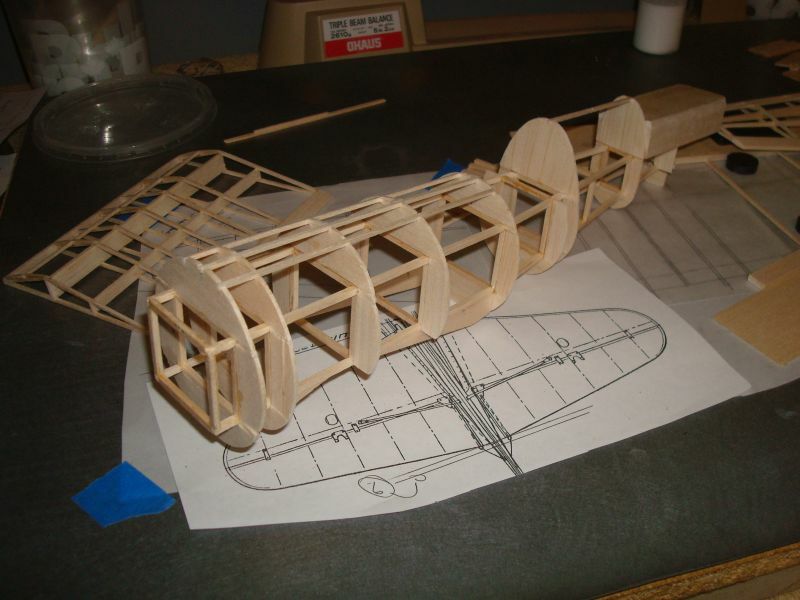 I'm building this from three views and have found considerable disagreement between the sheets of drawings but nothing that can't be fixed with more balsa and sanding. My razor plane just arrived while I was writing this so can begin to carve away the big block in the back and start adding the side stringers. 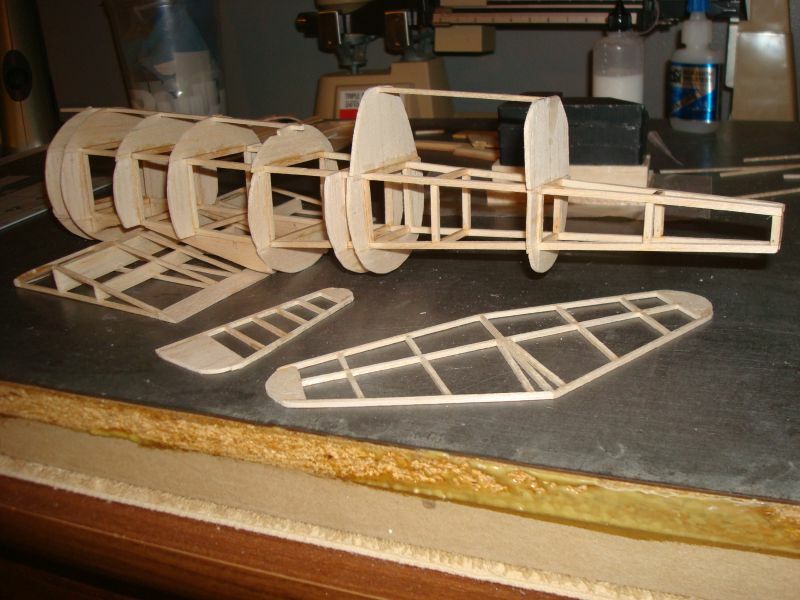 Still much sanding to do and need to bend some landing gear and make them plug in. This is coming very well. 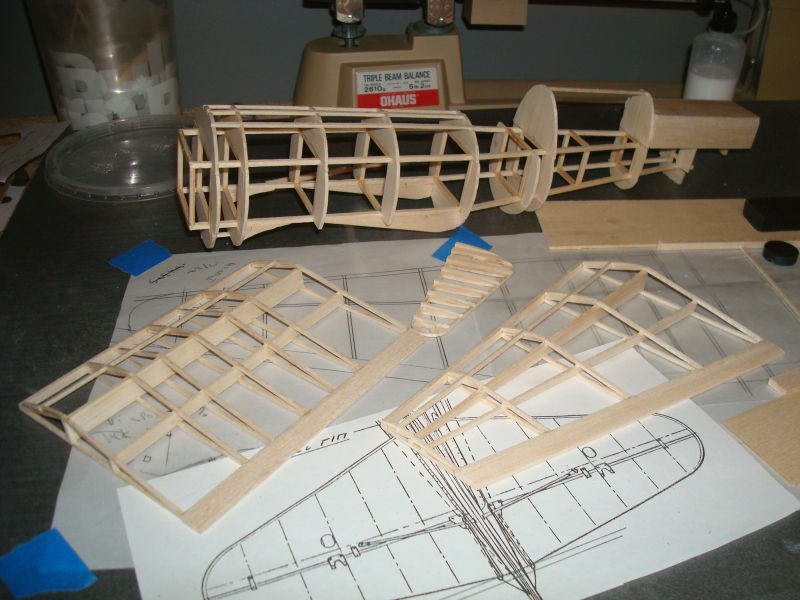 As far as the cracked rib wing construction is concerned, I believe it was Chris Starleaf that I first saw use this wing construction over on SFA when it was the premiere stick and tissue site before it went off line. Thanks to several modelers including our own Pete it's back up and running and lots of restoration of the former site material. So the cracked rib construction is not my invention... It does work well and is very strong and seems to fly well. Enjoying this build! Put together some time to work on the build and have overcome my stringer malfunction. Left wing done, center section done, vertical stab done, horizontal stab enlarged 15% and right wing laid out and started and my thin CA glue has turned to a very thick liquid so will move to the horizontal stab as I use thin white glue on these surfaces. 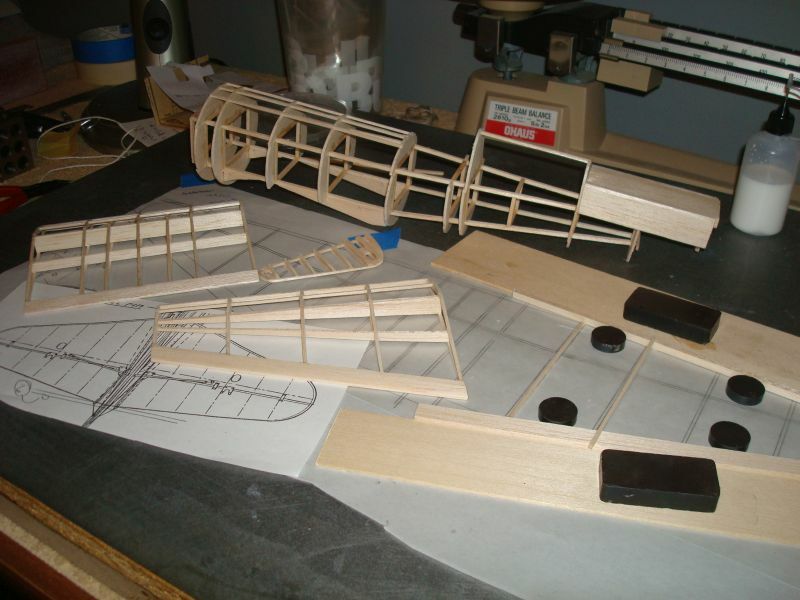 The big block at the rear of the fuselage is completely hollow inside and will be cut and sanded to remove about 75% of the material. I used it to have a zero incidence plane for the horizontal stab. 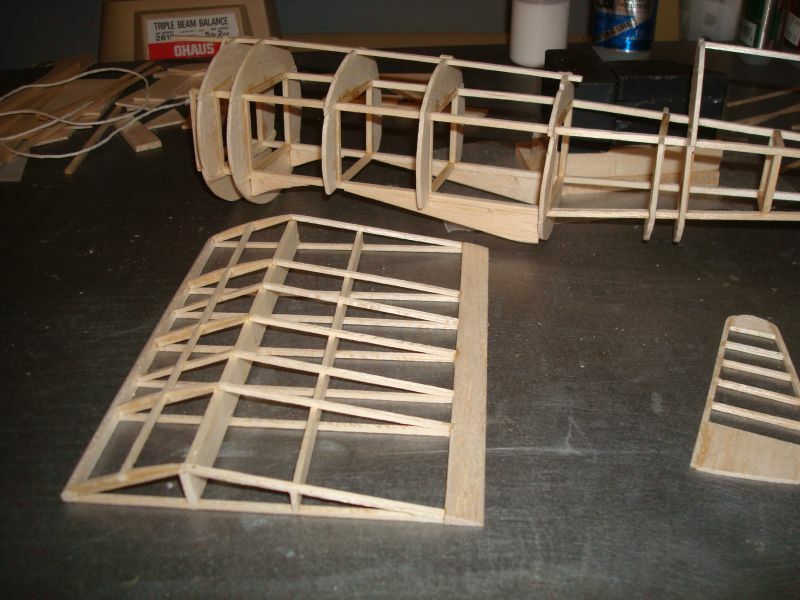 To me it is easier than trying to lay out all those ribs or stacking them up and sanding to shape. That never worked all that well for me and I have never tried this method. Have seen Tom use it and it seemed to work well for him but not sure how it will fly but time will tell. 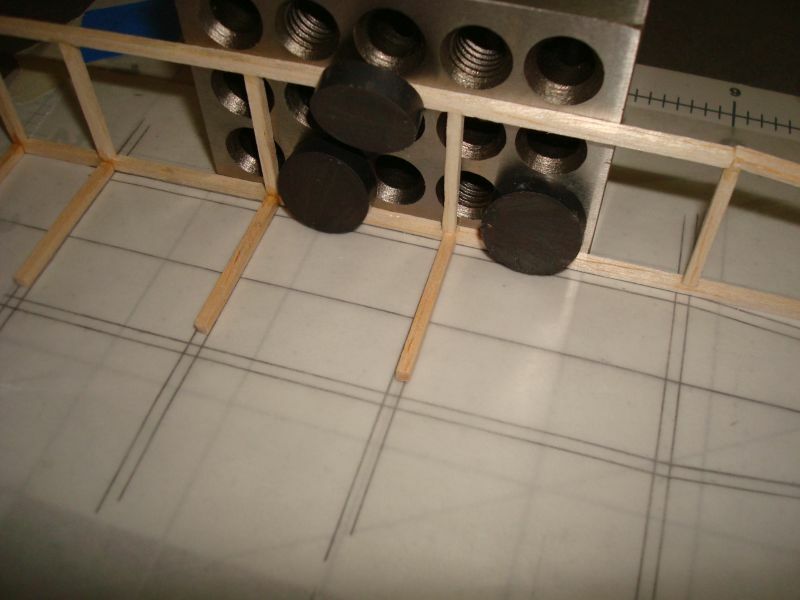 This is an area where thin CA glue works as there are a lot of joints that are next to each other and under stuff and the work goes much faster. 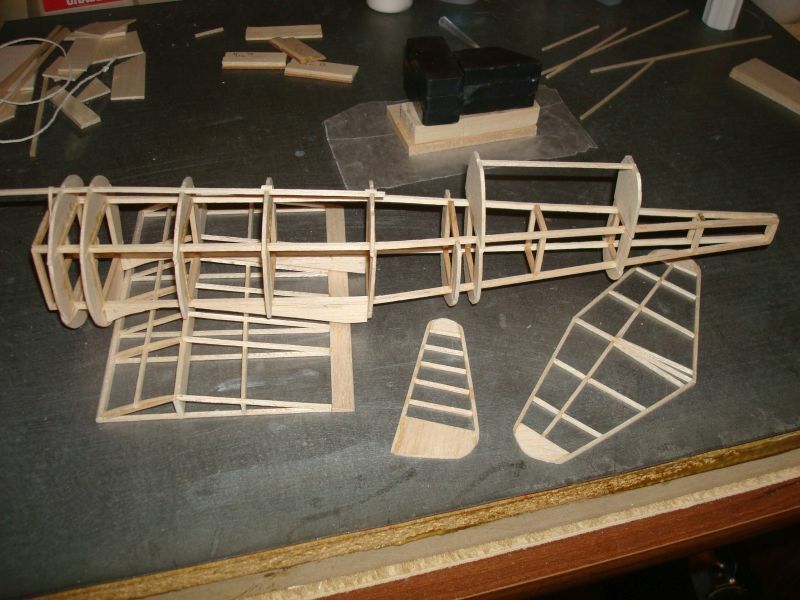 That's coming along really well, the Fuse and center wing looks really neat and tidy. 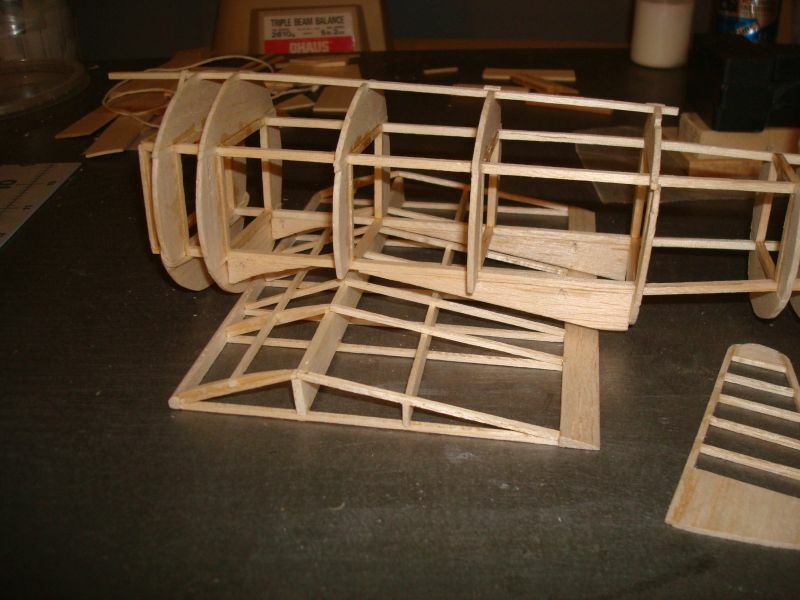 I've never tried building a Wing in that method. What are the advantages? Some Progress. Got the formers cut and installed but have made an unfortunate drafting error, about 1/16th on the side so had to fill in a bit and a lot of touch up sanding to do. 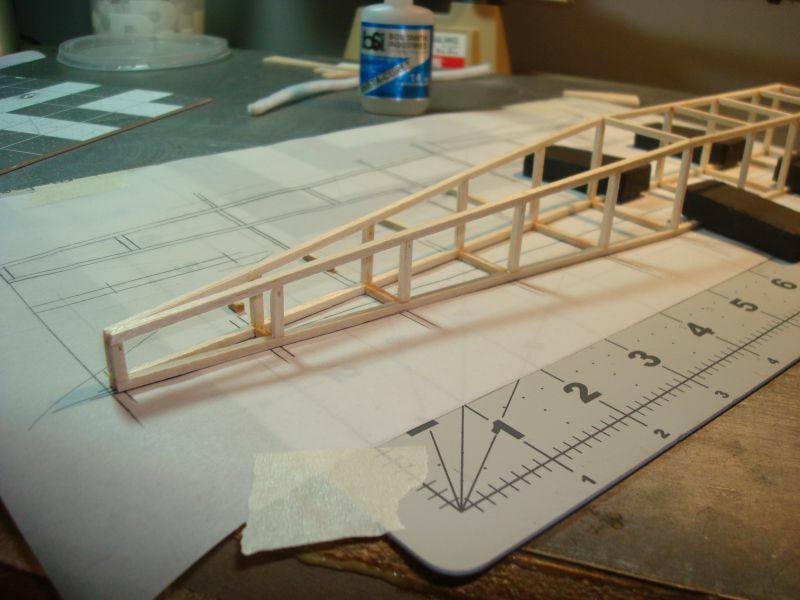 Got the horizontal stab and rudder outline completed and will add the other parts to give it an airfoil shape and strengthen it a bit. 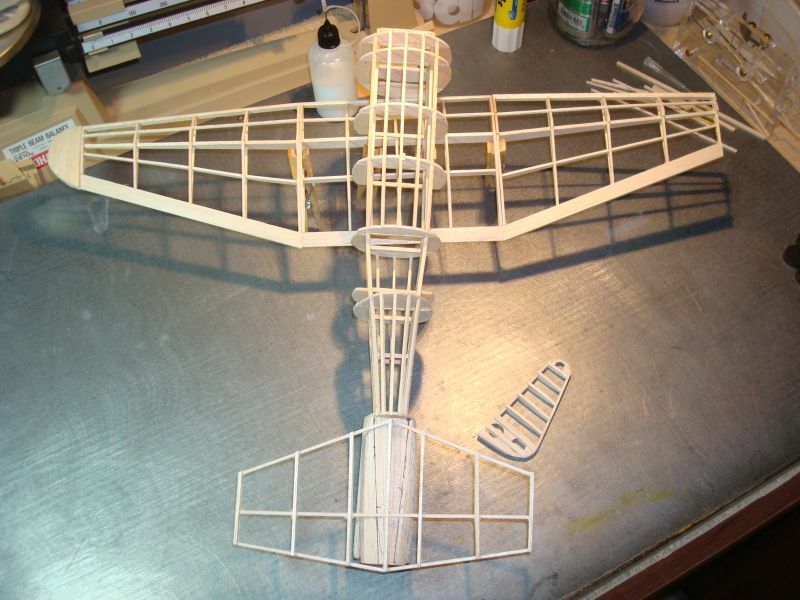 Wings go down next since the fuselage is an in-hand process. Alf - Thank you for the good words. 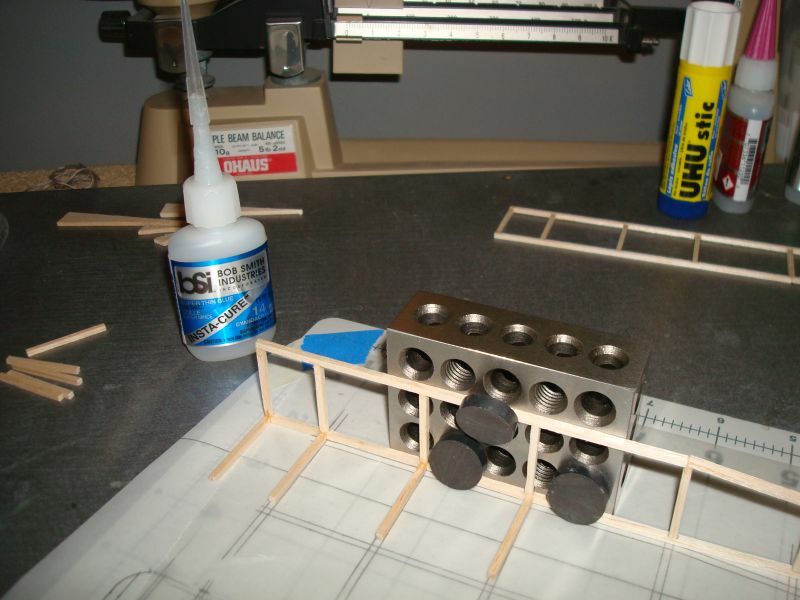 My trick, if it is really a trick is to glue the cross members to one side first, then add the other side and glue it in place. 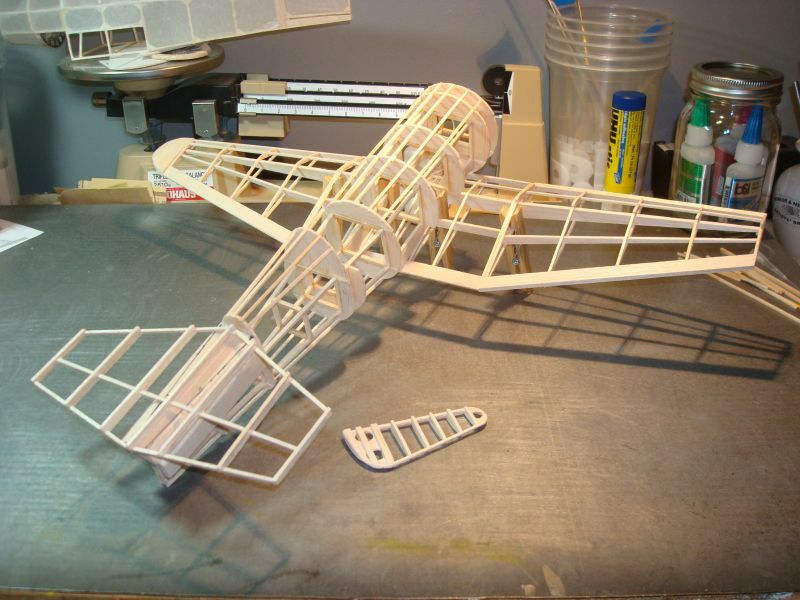 Reaching inside a pinned up frame was always a short cut for me to have an out of square fuselage. 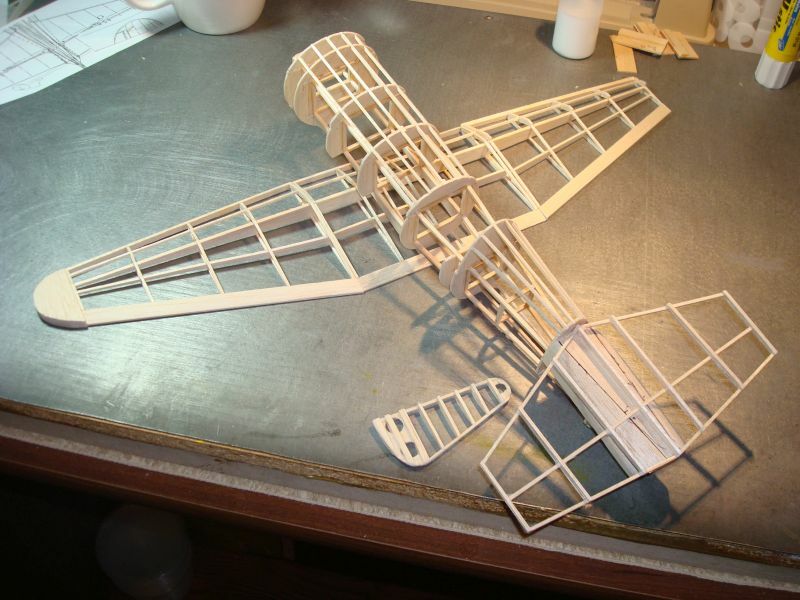 With this method you don't need to hold the fuselage in place to set all the little pieces. 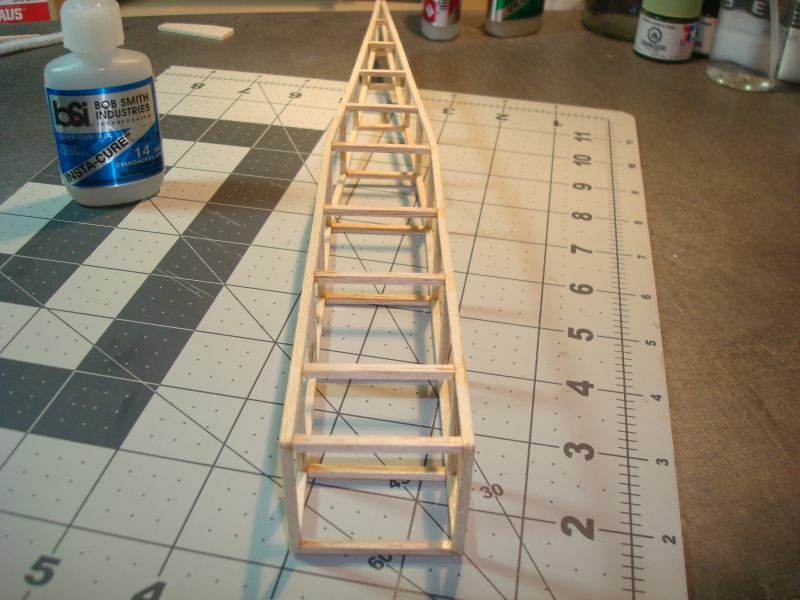 I figured it out with my Interstate Cadet as that fuselage was really deep and narrow, hard to reach inside. 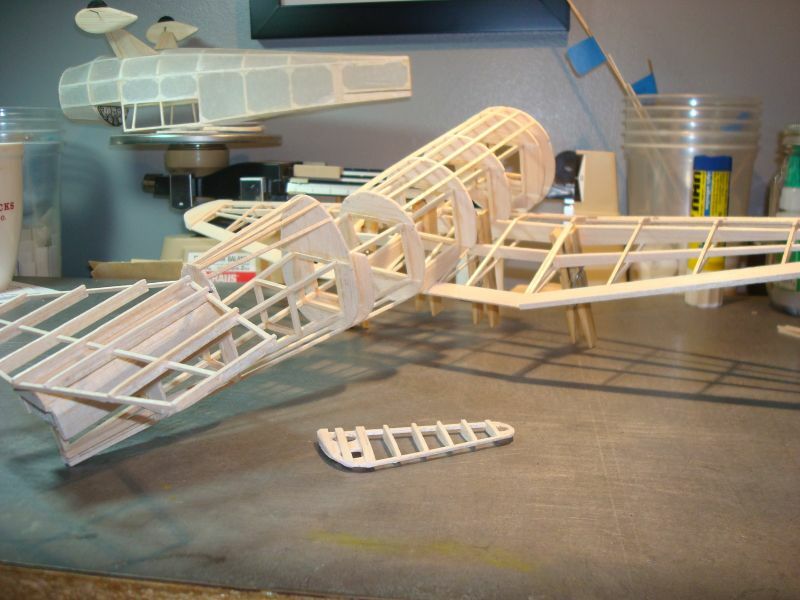 I've got all the same gizmos and gadgets as you but I can never get a box fuselage to turn out this well. Nice job!! Getting the frame finished and ready for formers. My new CA glue tool has been nothing short of fabulous, can reach into the tightest places and set a small drop of glue right where I wanted it. Best part, when the bottle is upright the glue runs back into the bottle and the needle is reusable. ref3 - These drawings are gone from any circulation I know of now, I bought them about 15 - 20 years ago and the organization went defunct and the president, Rudy Profant passed away about the same time. I have mounted an extensive search for any remnants of the organization but came up empty so my copies seem to be about all that is left, as far as I know now. Mike , are those plans available anywhere? I spent about an hour searching the web but didn't find any. Let's face it guys (and gals), those days of yesteryear were the days of propellers...and for the most part, that's what we're all about here. Glamour days they were, too, people like Roscoe Turner and his lion cub Gilmore! Absolutely striking color schemes everywhere! Go for it Mike...should be a "peace o' cake" (flew one of those once upon a time) for you...I can visualize it right now from your photos. It'll come together great! Thanks all for your good words and yes, the 30s stuff is truly great. I have 25 drawings such as this one all done by Kerka for the American Air Racing Society which is unfortunately gone and their president, Rudy Profant is also no longer with us. So, if this one works out well I may just stay with this theme. Wow, another interesting build. I agree with alfakilo, the 30's stuff is beautiful.